Newsweek put out a special edition magazine called Secret Societies: Infiltrating the Inner Circle. Of course, I had to buy it. The thing has sat on my desk for weeks, and I finally picked it up. The magazine includes stuff that I have read before, and my mind started to wander toward a question. Which secret society would I like to join? The Illuminati would be cool, but I would have to work with reptile people. The Shriners would be fun because I could ride motorcycles or go karts in Christmas parades. 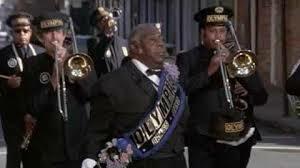 As a kid, I always looked forward to the Shriner band because a guy strutted in front of it while carrying a big sword. Bohemian Grove sounds interesting, but the way they frolic in the woods in kind of strange. The Bilderberg Group would be awesome. They only invite the wealthiest and most powerful. 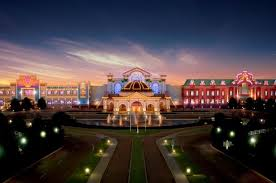 Getting to meet with them would mean being in the categories of the wealthiest and most powerful. Who would not want that? Heck, the list goes on and on. The Loyal Order of the Moose. Modern Woodmen of America. I do not think the P.E.O. Sisterhood would accept me. As I asked myself the question, all of that went through my mind. Then, it hit me. I do not have to wonder what secret organization I would like to join because I have already been a member of a secret organization. I cannot remember how many years ago it was, or I cannot tell you how many years ago it was. After all, it was a secret society. Some guys I knew decided to form a club where they could partake in intellectual discourse and debate. Out of these sessions, they could make decisions to help the community. It was also a way for the henpecked ones to get away from women for a while. I was asked to join because they thought I would be good at partaking in intellectual discourse and debate. Anyway, we met in a small church. To be a secret society you need religious symbolism, right? Also, one of the founders was a member of the church and had a key. At the first meeting, we named it the Cedar City Men’s Forum and set up the rules of the club. I cannot remember the rules, but you cannot have a secret society without them. After the formalities, we discussed the pressing issues of the day. Local politics. National politics. Star Trek. You know, the important stuff. We had several meetings and talked about a lot of things. However, we also wanted to give back to the community. Luckily, there was a huge community project going on. The city had built a new park, and local citizens were raising money for a really cool playground. 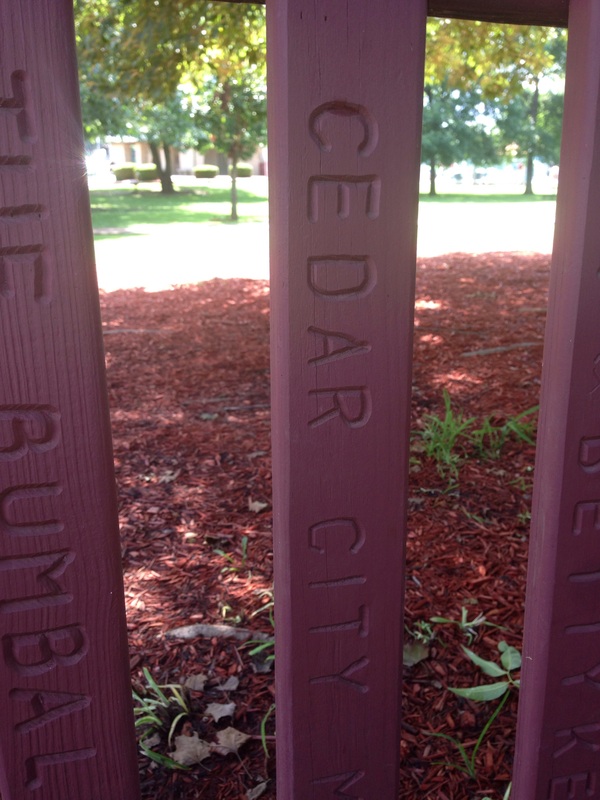 To get funds, they sold posts in the fence around the playground. The Cedar City Men’s Forum bought a fencepost. To be a secret society you need secret symbolism to be displayed in public places, right? We needed our name to be out there for people to look at and wonder what it all means. This afternoon, I went to the playground to find our fencepost, and there it was. Like other secret societies, the secret symbols outlasted the secret organization. After a few meetings, the Cedar City Men’s Forum discontinued. I cannot remember why it ended, or I cannot tell you why it ended. It could have been because we ran out of stuff to talk about. It could have been because of an attempted coup against the leadership. It could have been because the henpecked guys were told to come back home. It could have been because someone said Star Wars was better than Star Trek. Like other long-lost secret societies, we may never know. The other day, my stepdaughter and I were listening to the radio when a new song came on the air. In the beginning, I thought I heard a few notes that sounded familiar. Then, the entire thing kicked in, and it was definitely familiar. “Uma Thurman” by Fall Out Boy samples the theme from The Munsters, one of the great television themes of all time. 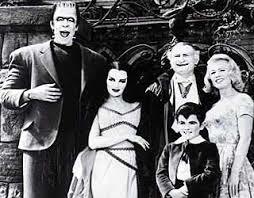 The song provided a chance for me to explain to my stepdaughter all of the wonderful things about The Munsters. However, it also made me wonder what other television themes could be turned into cool songs. That is when I decided to make a list. Before this begins, we need to address a few things. First, I have no idea how they combined The Munsters with Uma Thurman. That is a pop cultural mashup is there ever was one. Second, the theme songs must be instrumental to make for better sampling by current or future artists. Third, the songs must come from shows that I actually like. If I did not hear a theme song on a regular basis, then I see no reason for it to be used. These days, I do not watch much episodic television. In fact, Game of Thrones is the only current show that I watch. Luckily, it has an awesome theme song that makes you think the next hour is going to be a huge event. In the old days, there was a Texas version of Game of Thrones. Dallas was a prime time soap opera that followed the shenanigans of the Ewing clan. However, I thought the theme gone was the best part. When the camera flew over Texas Stadium, the home of the Cowboys, I had seen the highlight of the show. Of course, soap operas have been the staple of daytime television for decades. If someone wanted to put together a slower song, then the piano dominated theme for The Young and the Restless would do nicely. During the summers, I always made sure to listen to that song before I started doing something else. Another great piano theme belonged to The Incredible Hulk, starring Bill Bixby and Lou Ferrigno. However, this was not the opening theme. Rather, it was the closing theme. I can still see Bixby hitchhiking on a lonely road and trying the escape the anger within. Apparently, he did not like himself when he was angry. Anyway, that is enough for the slow songs. It is time to get back to something fast paced and rocking. Nothing epitomizes that better than the theme from Magnum, P.I. When I get a red Ferrari, I am going to ride around with that song playing all the time. Hopefully, some creative band will sample it in a song, and I will be able to change things up. Detective shows like Magnum, P.I. are always good fodder for cool theme songs. Barnaby Jones did some geriatric rocking as Buddy Ebsen ran as fast as he could after a criminal. When that tune is turned into a real song, I expect a clip of Barnaby running after someone or hanging out with Frank Cannon. The Rockford Files also had great theme music, and the video is ready to roll. All you need is a trailer with an answering machine and an early model Pontiac Firebird. Honestly, the original theme sound a little tinny, but some real instruments would make it awesome. Before I leave this list, I must include something from the Science Fiction genre. It will not be Star Trek or Star Trek: The Next Generation. Instead, we need to see a song built around the theme of Lost in Space. However, this is where we face a conundrum. Lost in Space had two theme songs. One was for the more serious version of the show’s early days, and the second came in with the campy era. I will go with the first one. Obviously, there are a ton of other theme songs that would be great for sampling. If you guys have any ideas, then let me know. I had a medical procedure that required going under anesthesia. Before all of the action took place, I was looking out the window. Cars and trucks were going down the interstate. Flags were flying in the wind. The world was moving as I sat with tube and wires hooked to me. Then, a scenario formulated in my mind. What if someone was put under anesthesia and they woke up in an alternate reality. Not one of those realities where the world is turned upside down. I mean an alternate reality with changes that are not immediately noticeable. 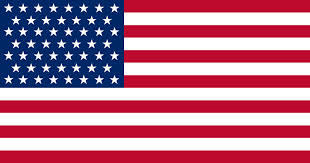 A flag with 53 stars. As the person goes along for a few days, they begin to notice these slight differences and realize that they add up to one big alternate reality. I am sure there are Twilight Zone and Star Trek episodes that deal with such things. May years ago, I started writing a story about a guy who had a wreck and ended up in a coma. When he woke up, his life was completely different from the one he remembered. He was totally confused and had to figure out what was going on. Was this his real life? Was he still in a coma? Were the memories he thought were real only figments of his broken imagination? I never finished that story. Other things in life gobbled up the time, and I put it away for a while. You know how it is when that happens. The thing you put away is lost forever. There was a time in my life when I wished I could transfer to an alternate reality. I was lost in a lot of ways and was in psychological shambles. I no longer wish for alternate realities because this reality is the one I want. When I woke up, they called my wife into the room, and she was by my side when the doctor came in for his consultation. She has spent the rest of the day taking care of me. I am happy with this reality because I am loved, and there is nothing more real than that. 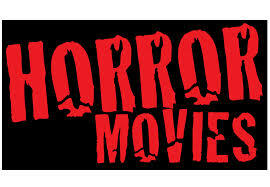 I like scary movies, but I do not see them that often. Why? Because no one else around me likes scary movies. Heck, my wife and my stepdaughter watch shows like Criminal Minds and cover their eyes during the crime scenes. How do you watch a crime show and not watch the crime? On top of that, my wife is always getting scared. If I walk into the room, then she screams. Never mind that we are the only people in the house, and she should suspect that I might walk in. It does not stop there. The last “scary” movie I saw was The Woman in Black. My nephew went with me, but he did not like it. He likes all kinds of gross stuff, but he is not a fan of scary movies. Honestly, I cannot see how people can get scared by a movie. It is happening on screen and is being performed by actors. Those are not real people, and they are not in the room. Getting scared in a dark alley? That is one thing. Getting scared in a dark theater? That is completely different. The other day, I saw a magazine about the “50 Scariest Movies’ that, I assume, was put out for Halloween. After all, Halloween is only two months away. To me, retailers putting out decorations two months before a celebration is scarier than any movie. Anyway, I picked it up to see how many of them I have seen and to write a blog post. I will list the ones that I have seen and write a short commentary about each one. Cat People (1942) – I am cheating on this one. I watched the 1982 version on late night cable. It starred the beautiful Natassja Kinski, and I was not watching it for the chills. As an impressionable young man, I was watching it for her thrills. The Thing From Another World (1951) – I saw this one a couple of months ago. It stars James Arness as the marshal of Dodge City. Wait, that is something else. 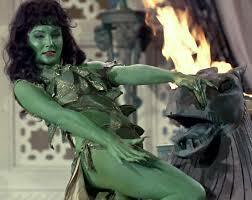 It stars James Arness as an alien plant kind of creature. The Fly (1958 and 1986) – Yep, the original and the remake made the list. The first one is best because it has Vincent Price, and it is creepy to see the fly guy caught in a spiderweb. Psycho (1960) – Has a scene about a naked woman covered in chocolate ever been this scary? Only Alfred Hitchcock could pull that off. The Birds (1963) – The other day, I tried to Tweet about The Birds, but autocorrect turned Tippi Hedren into Tipping Hedren. They should make a movie about someone killing autocorrect. The Exorcist (1973) – The theme song used to be my ringtone. Every time someone called, I was hoping it was Max von Sydow. The Wicker Man (1973) – This movie is not scary. How can a movie about people dancing in the woods and becoming one with nature be scary? In the end, Edward Woodward needed to call The Equalizer. The odds were against him, and he needed help. Jaws (1975) – After watching this, I really see no need to venture into the domain of sharks. We have legs and do not have gills. The Omen (1976) – Damien used to live in my neighborhood. At least, that kid should have been named Damien. There is no doubt that a 666 was carved into his head. Halloween (1978) – You think William Shatner overacts in Star Trek and those online travel commercials. You should see his mask overact on the face of Michael Myers. Friday the 13th (1980) – This got the decade off to a rousing start and made hockey goalies that much more menacing. I must admit that the old hockey masks looked a lot cooler than the new ones. I cannot imagine Jason wearing one. An American Werewolf in London (1981) – The lesson of this one? Do not go hiking down foggy roads in the United Kingdom. If you do, then spend the evening in the local pub. Poltergeist (1982) – You cannot trust real estate developers. Wait, I am a real estate developer. I just know not to build on a burial ground. A Nightmare on Elm Street (1984) – I have to admit that I always cheered for Freddy Krueger. My good friend Robert and I had an interesting meeting with Freddy at a Halloween haunted house. I should write about that when Halloween gets closer. Misery (1990) – I only have one thing to say. It has the worst use of a sledge-hammer in movie history. I could not get that out of my mind. The Silence of the Lambs (1991) – Cool movie. Cool characters. A big scene is supposed to happen in Tennessee. However, it took a few viewings before I realized what the lamb part was all about. The Blair Witch Project (1999) – A good friend of mine thought the footage was real. How could anyone be fooled like that. It is like those television shows that hunt for Bigfoot. I they had found it, then we would have already known it. The same goes for this movie. The Sixth Sense (1999) – I figured this one out when Dr. Crowe was having dinner with his wife. When I told the people I was with, they got mad. The Others (2001) – This is one of my all time favorite movies, and I figured it out pretty quickly, as well. However, I did not tell anyone. I learned my lesson from two years earlier. There you have it. Those are the movies on the list that I have seen. Interestingly, one scene in one movie freaked me out, and that movie is not on the list. I will give you a warning. If you ever watch The Ring, then you should turn it off before the final scene. This past week, I watched The Godfather on the big screen with my dad and my nephew. Obviously, it is a great movie, and I have seen it many times. However, this time was different. In a dark theater with no distractions, I was able to focus on details that I had missed and also fully enjoy some of my favorite scenes. One of those scenes is the funeral of Don Corleone. Movie funerals have always fascinated me. Usually, they are essential to the plot, but that does not have to be the case. For me, a well filmed funeral scene stands out, and I do not know why. Perhaps, it is because a movie funeral makes the film more realistic. It could be because it provides the ceremony of a funeral without a person really being dead. It could simply be the drama of it all. Whatever the case, some of my favorite scenes are funerals. 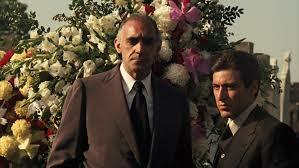 The funeral of Don Corleone is especially good because of all the underlying consequences. The heads of the other families get out of their limousines for the burial of the Godfather while they are plotting to bury the entire Corleone empire. Michael knows a betrayal is coming but does not know who the culprit will be. As people mourn his father, Michael is set up to be assassinated by Sgt. Fish from Barney Miller. Another great movie funeral actually involves an assassination. Before Paul McCartney sings the iconic theme song. Before Jane Seymour makes her appearance as a Bond Girl. Before Roger Moore makes his debut as James Bond. Before all of that, an American agent is killed in the French Quarter of New Orleans. He watches as a jazzy funeral procession passes by and does not realize until too late that it is his funeral. With that, Paul McCartney is cued to sing, and Live and Let Die begins. Before the death of the agent, the jazz band is playing “Just a Closer Walk With Thee,” a traditional gospel song. Other movies have also used well-known religious songs to great effect. This is where I have something to confess. In my mind, one of the most beautiful sounds in the world is “Amazing Grace” being played on a bagpipe, and no movie does this better than Star Trek: The Wrath of Khan. As Spock is buried in space, Scotty plays the pipes. 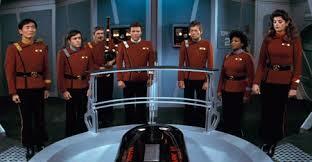 Then, Spock is shot into a dead planet that immediately springs to life. I guess that you could say Spock went out in a Blaze of Glory. That can also be said Valeria, Conan’s girlfriend in Conan the Barbarian. After being killed by a poison snake arrow fired by James Earl Jones, Valeria is mourned by Conan and burned on a funeral pyre. The wizard thinks the pyre will not burn, but the fury of Arnold makes it burn. Another dramatic exit took place in V for Vendetta, the graphic novel inspired story of a masked terrorist. When he dies, his muse, played by Natalie Portman, puts him on a train filled with explosives and flowers. She then sends it down the tracks toward Parliament. Once there, he finishes what Guy Fawkes started way back in 1605. As far as funerals for graphic novel anti-heroes go, V has nothing on The Comedian from The Watchmen. His death drives the plot of the movie, but there is more greatness. It is a miserably rainy day. The other anti-heroes show up. Dr. Manhattan even wears a suit. However, those are not even the best parts. “The Sound of Silence” by Simon and Garfunkel plays over the scene to greater effect than it did that scene in The Graduate. Then, there is the mourner who hides during the service. My favorite movie funeral scenes have someone watching from the distance who feels like they should stay away. Once everyone leaves, they go to the grave for their own private ceremony. In The Watchmen, Rorschach is the outsider who moves in after the fact. In Cooley High, it is Preach who comes upon Chochise’s grave after everyone else has gone. This is another awesome scene. A drunken Preach reads a poem over the grave as a classic tune plays over the scene. Then, he wads up the paper and takes off into the gloom. This movie is also cool because it tells what happens to the characters as they grow older. 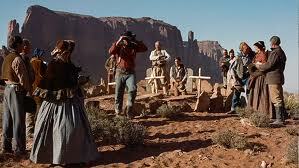 Alright, those are cool, but my favorite funeral scene with a distant viewer is in a western called The Sons of Katie Elder. The sons have come back home for the funeral of their mother. There preacher says some great words, and mourners tell the sons how great their mother was. However, one son is missing. He is a gunslinger who does not need to make a public appearance. 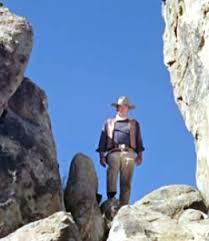 He is John Wayne, and he is standing in the rocks looking down on the funeral. John Wayne is also part of another great movie funeral. As his family is being buried in The Searchers, the Duke shuts down the ceremony because the time for praying is over. The time for vengeance has arrived. The time to end this post has also arrived.